Sri Lanka Cat Tour 2008 - Bird and Wildlife Team (Pvt) Ltd - The Best Birding and Wildlife Watching Tours in Sri lanka, and Tours in India. Steve Morgan 12/11/08, A ten day tour in Sri Lanka to find and observe Fishing Cat, Rusty-spotted Cat, Jungle Cat and Leopard. This report describes the results of a ten day wildlife tour in Sri Lanka (from 31/10/08 to 9/11/08). 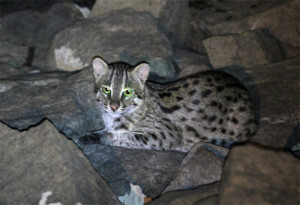 The principal objective was to find, observe and, if possible, photograph the wild cats of Sri Lanka: Fishing Cat (the top priority), Rusty-spotted Cat, Jungle Cat and Common Leopard. We also planned to spend some time searching for Grey Slender Loris and the endemic Red Slender Loris. Other mammalian targets included Giant Flying Squirrel, Purple-faced Leaf Money and Golden Palm Civet, (the latter at least being something of a long shot). Although the principal focus was on mammals we also hoped to find a good number of birds with a reasonable sprinkling of endemic and spectacular species such as Yellow-fronted Barbet and Black-naped Monarch. The tour covered a variety of sites in both the wet and dry zones, including sites at Sigiriya, Wasgomuwa, Yala, Belihuloya and Ratnapura. Exact details of these sites are not given in this report in order to protect confidentiality. 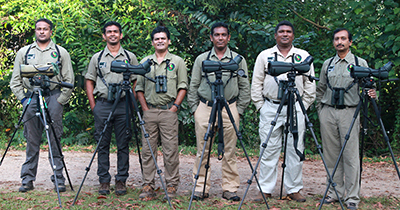 The team comprised Phil Telfer and Steve Morgan, led by Sri Lankan guide Uditha Hettige from the well respected Bird and Wildlife Team (Pvt.) Ltd. (www.birdandwildlifeteam.com). Our full time driver was Chandana. The Bird and Wildlife Team provided a minibus and driver for transportation between sites and for some night driving. At Wasgomuwa and Yala we conducted spot-lighting at night from open jeeps, which afforded much easier use of the spot-lights and permitted 360 degree vision. They also enabled us to use the high powered “Lance” spot-light connected directly to the vehicle’s battery. The Hotel Sigiriya (Sigiriya) – very pleasant tourist hotel with spotlessly clean rooms and excellent food. Willy’s Safari Lodge (Wasgomuwa) – mediocre tourist lodge with fairly Spartan rooms; food generally poor and service often comically bad. However, excellent garden and fine view of adjacent wetland. Elephant Reach Hotel (Yala) – superb tourist lodge with clean and well appointed rooms, very good food and excellent service. River Garden Hotel (Belihuloya) – set in riverine woodland and teeming with wildlife. Pleasant restaurant overlooking the woodland canopy. Rooms modestly appointed and slightly damp. Food of reasonable quality though service can be slow. Ratnaloka Tour Inns (Ratnapura)– fine hotel with interesting view across garden and pond (which has been known to attract wild cats). Very good food and service. We achieved nearly all of our objectives. We had very fine views of Fishing Cat at less than twenty metres, good (though brief) views of Rusty-spotted Cat, an incredible twenty-nine sightings of Jungle Cat, a good view of the rare and endemic Golden Palm Civet, close views of White-spotted Chevrotain and excellent sightings of Grey Slender Loris. We missed the Red Slender Loris, despite a good attempt on the last day, and narrowly failed to get Leopard in Yala National Park. Though birds were not the main focus of the tour, we did manage to record several endemic species, including Sri Lanka Woodpigeon, Yellow-fronted Barbet and Chestnut-backed Owlet. We did particularly well in regard to snakes, recording at least six different species including Indian Rock Python and the endemic Sri Lankan Green Pit Viper. The following is a detailed record of our daily activities and sightings. We arrived at Colombo Bandaranayake Airport at around 05.30 on a two-legged flight via Kuwait and met our guide from the Bird and Wildlife Team, Uditha Hettige. With everything having gone smoothly we soon found ourselves heading towards our first site at Sigyria. We stopped for breakfast en-route and recorded our first birds: Stork-billed Kingfisher, Alexandrine Parakeet, Yellow-billed Babbler and Asian Koel. As we progressed North-East from the airport, other common birds such as Cattle Egret, Asian Openbill and White-breasted Kingfisher were visible in many of the fields we passed. Arriving at the very comfortable Sigyria Hotel, Phil and Uditha found sufficient energy for a short walk around the grounds and were rewarded with Indian Pitta and White-rumped Shama. However, our first serious venture into the field came in the late afternoon when we headed towards the Sigyria Sanctuary. We quickly found Black-rumped Flameback, Asian Brown Flycatcher and Common Kingfisher as well as our first mammal, Three-striped Palm Squirrel. We managed a brief glimpse of two Brown Fish Owls in the fast-fading light and a disturbance in the trees on the far side of the track indicated the presence of one or more monkeys. Uditha claimed to have identified the culprit as the much-wanted Purple-faced Leaf Monkey but Phil and I were unable to get a good enough view to confirm the diagnosis. As darkness fell we progressed along the track and found ourselves in the company of Indian Pipistrelle Bats. We eventually reached a point where Uditha explained that previously there had been a tree on the opposite side of the track where he had sometimes seen Indian Giant Flying Squirrel. The tree had since disappeared but nevertheless we waited patiently to see if the squirrels were still around. And, on cue, one duly appeared – gliding from a tall tree on our side to one opposite where we had it in the spotlight briefly against the bare trunk. It quickly scampered up into the leafage and we lost it. Further waiting produced nothing and so we went back to the hotel for dinner. Later that evening we ventured out again and headed for a nearby site in the hope of Grey Slender Loris. Conditions were perfect – a warm, still evening with no rain or wind and our prospects looked good. Proceeding on foot, we quickly found several White-spotted Chevrotains, one of which allowed us to get within fifteen metres for a fantastic close-range view and a photograph. And at last we found our first Loris, one of five that evening. All were seen at close quarters and most allowed fairly long views before heading up into the safety of the canopy. With an unbelievable eight Chevrotains and five Lorises in the bag we set off for another site in search of cats. However, despite finding no cats at our next port of call, we more than made up for it by finding the endemic (and rare) Golden Palm Civet. Initially we found the animal on the ground and Phil and I both diagnosed Common Palm Civet. However, the animal quickly scaled a palm tree about twenty metres in front of us and, as we trained our spotlights on it, Uditha nonchalantly called “Golden Palm Civet”. Indeed it was and for some ten or twenty seconds we had superb views before it disappeared irretrievably into the canopy and out of sight. We found a bat roost and added False Vampire Bat and Painted Bat to our haul before deciding to call it a night and head for the hotel. We had one last new mammal to add to our burgeoning list – a brief view of a Jungle Cat fast disappearing into thick grass, thereby putting the finishing gloss on a fantastic first night in the field. We reluctantly left Sigyria after only one night and headed for Willy’s Hotel at Wasgomuwa. Phil had found Grizzled Giant Squirrel in the grounds of the Sigyria Hotel before breakfast, hinting at the potential of the area and, on hindsight, a second night would have been justified. A rather dull and uneventful drive took us to a minor road South of Wasgmuwa where a partially-filled canal ran parallel with the road for some ten or more kilometres. The canal occasionally ran through reed-fringed wetlands and looked good Fishing Cat habitat. (Indeed Richard Webb on an earlier visit had found Fishing Cat there). On the opposite side of the road were extensive areas of cut paddyfields – ideal, we thought, for Jungle Cat and Rusty-spotted Cat. We looked forward over the coming nights to spotlighting this promising area. For the moment we had to be content with a few diurnal birds and Scaly-breasted and White-rumped Munia together with Ashy and Plain Prinia joined our list. Arriving at the modest, though reasonably comfortable, Willy’s Safari Lodge (just outside Wasgomuwa National Park) we took lunch and rested before our intended afternoon foray into the park. Knowing that Richard Webb had found two Fishing Cats in daylight inside the park on his previous trip we looked forward to seeing for ourselves what it had to offer. After a short detour to find Indian Pitta at the park entrance, (we also found Black-headed Cuckooshrike and Banded Bay Cuckoo), we transferred to a jeep and headed into the park. Almost immediately we found Asian Elephant and Feral Buffalo. Indeed we were to go on to find some ninety or more Elephants that afternoon, a good proportion of the presumed total population of around 250. At the many water holes we found Painted Stork, Purple Swamp-hen, Lesser Whistling Duck as well as various waders: Wood Sandpiper, Marsh Sandpiper, Common Sandpiper and so on. A few Chital were present, though surprisingly few in number. The water holes looked highly promising for Fishing Cat and we scanned expectantly, especially at the best of the wetland areas which we had reserved for our last hurrah at dusk. But no cats appeared and we were obliged to return to Willy’s for dinner empty-handed. For our night drive that evening we explored the local roads and the afore-mentioned canal. We quickly found a Golden Jackal, which looked initially rather cat-like and caused a stir of excitement before its true identity became clear. However, to our great disappointment, we found virtually no other mammals. Worse was to come in the early hours of the morning. Working our way along a quiet country road through dry paddyfields we were overtaken by two individuals on a motor-cycle who shouted something at us in a distinctly unfriendly tone. We ignored them and continued along the road into a small village. Suddenly we were jolted by a loud and alarming crack, which I presumed (incorrectly) was a stone being dislodged from the road and hitting the underside of the vehicle. We stopped to investigate and found two severe indentations on our near side – which could only have been caused by a stone being thrown at us by some-one at the roadside. Somewhat shaken, we turned the vehicle around and headed back. But we had only gone a short way before a second assault from the stone-thrower shattered one of rear side windows, showering the inside of the vehicle with broken glass. We pulled in at a nearby Buddhist temple to inspect the damage and found ourselves in a rather surreal scene. With very loud recorded Buddhist music and chanting being blasted into the late night air and a crowd of some twenty or thirty curious temple-goers excitedly gathering around us we tried to make sense of what was happening. We guessed that the mystery stone-thrower was one or both of the hostile bikers we had encountered earlier, though when Uditha and some of the people at the temple went to look, they had long departed. Uditha called the Police to report the incident but obviously there was very little either they or we could do. Eventually we decided to head back to Willy’s, our driver understandably taking he first few kilometres at breakneck speed in order to avoid the possibility of a third attack. In all, a very disappointing and strange evening! With the exertions of the previous two days taking their toll, we slept in until midday and took a leisurely lunch. In the pleasant hotel garden we found Ruddy Mongoose and a few birds including Indian Robin, Common Tailorbird and Brown Shrike. The afternoon saw us return to the Wasgomuwa National Park and, in a re-run of the previous afternoon’s drive, we again found Asian Elephant, Feral Buffalo, Wild Boar, Chital and Golden Jackal. We tried the two best looking water holes at dusk but again no cats were forthcoming. We did, however, find one or two nice birds including Chestnut-winged Cuckoo and the endemic Brown-capped Babbler. For the evening drive we availed ourselves of an open jeep in preference to our normal minibus, from which we hoped that spotlighting would be more comfortable and productive. The jeep would also allow us to explore some interesting off-road sites that would otherwise be inaccessible. We commenced operations in an area close to Willy’s and adjoining the park. Bouncing along a very uneven track we soon found eye-shine and the two bright, green eyes staring at us immediately signified cat. Unfortunately, the animal flushed before we could get a closer view, though Uditha claimed he make out its shape and colour and was convinced it was a Rusty-spotted Cat. A very frustrating near-miss! With nothing else showing in this area we returned to the canal and worked our way along to a second off-road area – one protected by an electric Elephant fence which had to be carefully disengaged to allow our vehicle through. We crossed an open grassy area next to a wetland which produced only Black-crowned Night Heron and a few Elephants making a nocturnal promenade outside the park. After a thorough investigation we returned once more to the canal with the plan of scanning more or less the whole length of it. Fairly quickly we found a pair of Brown Fish Owls and then, later, a third. But, despite travelling almost the entire length of the canal we had still found no cats. On our return back along the canal we did at last find eye-shine and, dismounting from the jeep, we excitedly trained our spotlights on the culprit. We were astonished to find not, as we expected, a cat but rather a Eurasian Otter! And only thirty minutes later we were even more surprised to find a second, giving superb views at less than twenty metres range! We subsequently found Jungle Owlet and Black-crowned Night Heron but, to our chagrin, no cats. With the evening advancing we decided to try one last area in which, apparently, Uditha had been successful with Fishing Cat in previous trips. The area looked quite disturbed with heavy lorries periodically grinding their way noisily along the narrow tracks and we despaired of finding anything in what seemed a very unpromising environment. However, to our amazement, Uditha suddenly announced that he had eye-shine in his spotlight and when we got out to follow it up on foot we found a Rusty-spotted Cat staring at us from behind a small earth ridge. We stared back for about ten seconds, only some fifteen metres away, before the cat flushed and bounded off into thick scrub. A brief view but a superb head-on encounter with this difficult species. We were, naturally, delighted! Dawn was now not too far away and we headed back to Willy’s, but not before we had found a Ring-tailed Civet (Small Indian Civet) which (momentarily) fooled us into thinking we had got a Fishing Cat. And so, at the very last, Wasgomuwa had redeemed itself. We started out, bleary-eyed, around mid-morning with a long drive to Yala in prospect. However, a few good birds graced the journey – including Ashy Woodswallow (just after leaving Willy’s), Oriental Honey Buzzard and Shikra. Our route took us past the Eastern edge of Yala National Park where a corridor of bare ground had been created either side of the road to allow the army to set up rifle pits with a clear field of fire. The park, sad to say, has been used regularly by LTTE guerrillas and the road has, at times, been closed to the public. It was a dispiriting sight to see the park boundary mutilated in this way and disconcerting to realise that the park was undergoing continual disturbance from army foot patrols. Eventually we reached Kataragama where we stopped for a late lunch. The cafe we chose had a very pleasant garden which hosted some nice birds and were treated to the sight of Pompadour Green Pigeon and a pair of Asian Koels as we ate. Thus fortified we pressed on and in the late afternoon checked into the excellent Elephant Reach hotel at Kirinda, some eleven kilometres South-West of Yala National Park. At 19.00 we assembled at Reception for the evening drive. Woolly Horseshoe Bats were circling the open Reception area and, given the success that I had had in this area on my previous trip in March, our hopes were high that we might find a cat or two. We did not have too long to wait. Setting out on a local road, we soon found eye-shine that revealed itself as Jungle Cat. And before long we had added both Common Palm Civet and Ring-tailed Civet. Reaching the end of the road we turned round and spot-lighted our way back to the hotel. The return leg proved even more productive than the outward one. Phil soon spotted a very fine Indian Rock Python beside the road, superbly marked and about ten feet in length. We were able to inspect it at very close quarters before it eventually retreated into the undergrowth. Moving on we found two cats in the road having a rather vigorous disagreement. They were two male jungle Cats and the more dominant cat, having proved his point, marched off triumphantly down the road. This left us with the lesser of the two, a young male with a damaged left eye (earning him the nickname “Leftie” thereafter!). We photographed the obliging Leftie at very close range – some three or four metres on foot – before leaving him in peace. Our purple patch continued and we added Cat Eye Snake to our list, a very nicely marked snake of around two feet in length. And, on reaching the outskirts of Kirinda village, we found yet another young Jungle Cat which too had its portrait taken. After the trials of the previous evening at Wasgomuwa it seemed that we were back on the right track and we looked forward to an early start the next morning and a first crack at Yala National Park itself in search of Leopard and Sloth Bear. We set off at 04.00 and spot-lighted our way along the road. All seemed quiet and, apart from unidentified eye-shine not far from the security gate (probably a pair of Golden Jackals) we found nothing. As dawn broke we picked up our jeep (which had come from Elephant Reach to meet us en-route) and made our way to the park entrance. As we completed the entry formalities we found a number of Paddyfield Pipits and a Richard’s Pipit on the grass verge, together with several Wild Boar which nonchalantly wandered past with hardly a passing glance. The principal target for the morning being Leopard, we raced off towards the area most likely to produce it – namely the area round the rock massifs near the seashore. The tactic seemed to be to cover as much likely ground as possible as quickly as possible. This approach seemed dubious to me and I felt that a more deliberate approach might prove more effective. It also precluded seeing much else as we were usually moving too quickly to stop for anything else (such as birds) that might justify a closer look. Not entirely unexpectedly we found no Leopards. We did find a few Asian Elephants, Sambar Deer, Grey Mongoose and lots of Chital and Wild Boar. (The high numbers of Chital were in stark contrast to Wasgomuwa where their numbers were so few). We also found Crested Serpent Eagle, Black-headed Ibis , Pheasant-tailed Jacana and Common Iora. We took a well-earned rest in the afternoon before setting off at 19.00 for what we expected to be a very long and intensive night spot-lighting session. We were quickly into action along the same road we had tried the previous day with a pair of golden Jackals on the shoreline and followed this up with several Ring-tailed Civets and a Jungle Cat (which turned out to be our old friend “Leftie”). We attempted to spot-light our way to Yala hotel (a good area for cats, notably Leopard) but found our way blocked by Elephants. With the Elephants reluctant to move we had to reverse and with time passing we returned to the hotel for dinner. After dinner we set out again and found yet more Jungle Cats and Ring-tailed Civets. Indeed, we finished on the remarkable totals of nine for each species that evening. We had expected Jungle Cat to be fairly easy but this was getting ridiculous! We took the morning off to rest and set off for our second drive inside the park at around 15.30. We would have started earlier but the army had closed the park for a short while to carry out patrols – the reason for which became apparent later that evening. En-route to the park we found Rosy Starling in roadside bushes and some interesting waders along the shoreline near to the security gate: Curlew Sandpiper, Kentish Plover and Common Greenshank. We also had a fleeting glimpse of Ceylon Woodshrike, a bird that throughout the trip seemed destined to flush whenever we were on the point of focusing our binoculars on it! The drive in the park followed a similarly manic pattern to that of the previous morning with the driver apparently intent on racing between water holes and rock massifs in the vain hope of surprising a Leopard. Elephants, Buffalo, Sambar and Chital passed by in a blur. We did manage to find Blue-faced Malkoha and Ashy Drongo but once again the Leopards and the Sloth Bears eluded us. As darkness fell we left the park and spot-lighted our way back to the hotel along local tracks finding two more Jungle Cats and a Ring-tailed Civet en-route. After dinner we set out for our night drive, intending to leave our previously tried roads alone and try the wetland areas South and South-West of Kirinda. For quite a while things were very quiet and, apart from a Little Indian Field Mouse beside the road, we could find nothing. And soon after, at a small village, our prospects seemed about to diminish further. We met a worried-looking group of men who informed us that a boatload of LTTE guerrillas had (reportedly) landed somewhere along the Yala coastline the previous day bent on causing mischief and that the army was out searching for them. Obviously our spot-lighting would be very unwelcome. However, for the moment at least, we continued on our way. We spot-lighted some wetland areas a little distance away from the scene of this drama, working our way along a minor road that flanked some very good Fishing Cat habitat. However, we had not gone far before we were stopped by another group of men, this time some of them being armed. It transpired that these were security guards from a nearby Wildlife Reserve and, unsurprisingly, they were less than enthusiastic about our nocturnal spot-lighting. Nevertheless, we continued on our quest once again. With the target wetlands now more or less hors de combat we cut Southwards into paddyfields that, hopefully, we might be able to explore without causing upset. And at around 01.00 we finally hit he jackpot. Passing a reed-fringed pond, Uditha scanned the Lance across the far bank and, just as we were about to round a corner in the road and leave the pond behind, three voices simultaneously cried out “stop!!”. A small feline face had revealed itself – one that I thought had to be Rusty-spotted Cat. We stopped, reversed and caught the cat fully in the beam. But far from being Rusty-spotted the cat was actually Fishing Cat! Incredibly it sat there on a grass bank not twenty metres from us glaring at the beam, apparently quite relaxed and unfazed. We could clearly see its facial markings, the thick black spots along its flank and its short tail. For about twenty seconds or more we sat staring at each other. At length, with the cat seemingly calm, Phil quietly reached down for his camera bag. But in doing so he must have made some small disturbance and the cat got up and slinked off into the undergrowth. We had had an absolutely fantastic view already, but Uditha thought we might be able to do better and decided to put some bait out – the plan then being to sit quietly for an hour or so to see if our cat might return. As Uditha threw several dead fish baits at the far bank (where the cat had been) I kept my spot-light trained on the area. However, despite all the commotion (Chandana had got down from the driver’s seat and Phil and I were in quite loud conversation) I suddenly spotted eye-shine in the beam. We all quietened down and I turned off the light. A few moments later I turned on again and found more eye-shine a little to the right, very close to where the cat had originally been sitting. Another quiet spell with the light switched off. With the tension mounting I turned the light on one last time and, unbelievably, there in the beam was our Fishing Cat sitting on its haunches back in (apparently) its favourite place. We watched it for a further fifteen or twenty seconds before it retired for a second time. With baits in place we waited and watched for a while but it was clear that the cat was not going to oblige us a third time and so we left it in peace with the intention of returning the following night. With the night now well advanced we decided to make our way back to the hotel, recording two more Jungle Cats, a Common Palm Civet, Two Ring-tailed Civets and two Indian Scops Owles on the way. Rising at the crack of noon we took an early lunch (late breakfast?) and got ready for our last attempt to find a Leopard in Yala. The previous day the army had kept the park closed until 15.30 to allow them to carry out patrols (presumably looking for the LTTE guerrillas that everyone was talking about). But now there were no such restrictions and we set off at 14.00 with time, for once, on our side. En-route to the park we found many of the usual suspects – the regular cast of waders plus more Rosy Starlings and a Common Iora. And at the gate, the usual Paddyfield Pipits were visible on the grass. Outside the park office the same “Wild” Boar as the previous day was hanging around by the water hole. With plenty of time available and with little chance of a Leopard until much later in the afternoon, we sauntered around the park in a very leisurely fashion. We had a fine view of a Common Rat Snake near to a water hole (around seven feet in length) and found Soft-shelled Turtle and Black-hooded Oriole (among other familiar avian species). In fact, though we found nothing particularly remarkable, the new “softly-softly” approach was proving very enjoyable. However, as the afternoon wore on and the prospects of Leopard began to improve, the driver reverted to his previous tactic of trying to cover territory at speed. Whether this approach is the best way of finding Leopard is moot (I suspect that a slower, more deliberate method might work better) but what is beyond doubt is that it is “all or nothing” – there is little opportunity to stop for other things such as birds, reptiles or small mammals. However, we did come close to finding The Spotted One. As we sped along there was a sudden ripple of excitement from the driver, the (park) guide and Uditha. We screetched to a halt, quickly reversed and among much finger-pointing and frenzy Phil and I eventually divined that someone had spotted a Leopard. However, the cat had been on the move along the edge of a wooded area some eighty metres away and had now completely disappeared from view. And, though we returned several times that afternoon to check, (there was speculation that it might have intended coming to a roadside water hole to drink), it did not come back. No surprise to me, at least! The remainder of the drive was uneventful, though at the park gate we were pleased to find a Bronzeback Snake (a small non-venomous snake of around twelve inches that allowed itself to be handled without fuss). With darkness falling we were obviously keen to return to the site where we had seen the Fishing Cat the previous night. However, this was to be the “night of the Jungle Cat” and on the way back to Elephant Reach we found the first two of what was to eventually be eleven Jungle Cat sightings that evening. Our plan after dinner was to take a circuitous route back to the Fishing Cat pond with the intention of arriving there after midnight. En route we planned to investigate various tanks and wetlands which might also offer cat possibilities. The first of these took us along a narrow levee under a canopy of overhanging trees. To our right was a large tank covered in lily-pads and to our left paddyfields. The habitat looked superb (though we took a pounding from the overhead foliage in the open jeep) and produced Pintail Snipe in flight and Marshmugger Crocodiles along the shoreline. But no cats were in evidence. Our next port of call was a wetland area very close to Tissa and quite heavily disturbed by human activity. I expected little but just as we were about to pass the area Uditha picked up eyeshine and we stopped to investigate. As Uditha scanned with the Lance we got a glimpse of a cat moving away to our right into thick reeds and scrub. The cat, though little more than a vague outline, appeared to be a stout, medium-sized animal and I could just make out black spots on its flank. There could be only one conclusion – we had found another Fishing Cat! We got out to see if we could re-locate it on foot. Proceeding warily into the undergrowth (there are often dangerous snakes present in such places) we reached a quiet, reedy pond about thirty or forty metres from where we had first seen the cat. Phil was in front and a sudden commotion, almost under our feet, had him pointing furiously to reeds on our right. The cat had been flushed from right in front of us. However, despite further searching, we were unable to find it again and we gave up and went on our way. A short cut to the original Fishing Cat area proved rather more difficult to navigate than we had expected and it was quite some while before we eventually returned to the scene of the previous night’s drama. There was, disappointingly, no sign of the Fishing Cat though we were more than a little surprised to find another Eurasian Otter as consolation. The Jungle Cats were out in force – we found three in a single paddyfield – and in another we found a mother and a juvenile together. Quite possibly the mother was trying to teach the youngster about hunting but, if that were the case, then Junior’s playful antics were proving far from helpful! Several times, as the young cat carelessly gambolled and frolicked, the mother gave her quiet “yipping” contact call – presumably telling it to sit still, shut up and behave itself! Of course, the delinquent juvenile ignored her! The eleven Jungle Cats we found that night (it might even have been twelve but for one we “disallowed” as a probable hybrid) brought our tally for the trip to an improbable twenty-nine. 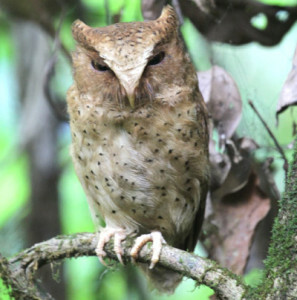 Otherwise, we found a few Owls (Brown Fish Owl and Indian Scops Owl) and a Common Palm Civet. (The Ring-tailed Civets that had been so common thus far seemed strangely absent). At around 03.00 we called a halt and headed for the hotel, mindful of a relatively early start the following day. By 11.00 we were on the move with a very long drive to Belihuloya ahead of us. The first couple of hours to Wellawaya took us along fine, well graded roads and passed quickly, interrupted only by a brief sighting of Black Eagle. Thereafter the road wound its way tortuously into the highlands. Our pace slowed though this was completely compensated by the spectacular scenery. A short rest stop near Beragala produced superb views of Sri Lanka Hanging Parrot and Plum-headed Parakeet and the endemic Layard’s Parakeet. We arrived at the River Garden hotel in Belihuloya in mid-afternoon. As we took a late lunch we were disconcerted at the gathering storm clouds that shrouded the higher ground and threatened rain that evening. The hills were already lost in mist and rain and, rightly, we feared the worst. Our plan before dinner was to explore a track near to the hotel for Red Slender Loris. The track in question led to the entrance to a large tea estate and cut through thick trees – which protected us to some degree from the rain that began to fall almost as soon as we had started. With no Lorises to be found and with the rain falling ever more steadily we soon gave up and went back for an early dinner. A lull in the rain encouraged us to believe that we might get a full night’s catting and after dinner we headed for an area along a river where Fishing Cat were known to be regular. And matters got off to a flying start with a glimpse of a Yellow-striped Chevrotain in the road. However, no sooner had we disembarked from the minibus and walked down a hillside to the river, than the rain started again – this time in earnest. Waterproof gear was rapidly unpacked and in a downpour we set off along the river and into paddyfields. But the going underfoot was dreadful; the recent rain had turned the ground into a quagmire. And the deluge we were enduring would certainly prevent us from seeing anything (even if it were to venture out). So were decided to stop and return to the hotel, returning via an easier hillside route through woods. The return journey was not entirely uproductive in that we saw an Indian Muntjac in the woods and on the road we found a Cat Eye Snake (species uncertain). But our hopes of finding a Belihuloya cat were fast receding as we contemplated the possibility of several days of heavy rain ahead. With the weather so resolutely against us we slept in and came to the restaurant at midday for brunch. The skies were uniformly grey and drizzle was still falling. The hills were now completely invisible and we were left wondering if and when we might get back into the field. Our gloom was tempered by the discovery of a handsome Green Vine Snake in the tree canopy next to the restaurant. Uditha managed to hook it out of the trees with a broom handle and Phil and I both had the opportunity to handle it and inspect it at close quarters. The snake was around three feet long and, though mildly venomous, was quite relaxed and unaggressive. After some photography we released it back into the trees and it slipped away as though nothing untoward had happened to it. As the afternoon wore on and more pots of tea were drunk the skies miraculously cleared and the rain eased. By 15.30 we could again see the distant hilltops and the clouds were breaking. In places we could even see patches of blue! And so, without further ado, we set off for a spot of ad hoc birding. Our target was a nearby tea estate where Uditha had secured permission for us to explore after dark that evening. The plan was to bird and recce the area in whatever daylight remained and then to return after dinner for a spot-lighting session along the main track. The first half of the plan worked very nicely – we found a clutch of nice birds, including Grey –headed Canary Flycatcher, Kashmir Flycatcher , Dull Blue Flycatcher, Blyth’s Reed Warbler and Velvet-fronted Nuthatch. And it was with mounting optimism that we returned o the River Garden hotel for dinner in expectation of a productive night session ahead. However, to our intense frustration, the weather closed in once again and by 21.30 the rain was falling in sheets. We had no option but to cancel the night’s spot-lighting, a second abbreviated day in succession. Chastened by the previous evening’s washout, we determined to make a dawn start at the tea estate to see if could at least find a few more interesting birds. Phil opted to sleep in but Uditha and I set off at 06.30 in unexpectedly brilliant early sunshine and with a fine day in prospect. We had barely gone two hundred metres before Uditha stopped the vehicle and we got out to investigate a little stream that ran parallel with the main road. Uditha had heard the much-sought Black-naped Monarch calling, though we were unable to find it. As consolation we did find Tickell’s Blue Flycatcher and Emerald Dove. Reaching the tea estate we drove our way along the track past the entrance gate and then got out to bird our way up the hill. In the bright sunshine a lot of birds were active and we quickly found Large-billed Leaf Warbler, green Warbler and Brown-breasted and Asian Brown Flycatcher. With only a little effort we found the endemic and very handsome Yellow-fronted Barbet and further along the road Pied Thrush and Sri Lanka Woodpigeon. In the distance we could hear Chestnut-backed Owlet and some adroit calling from Uditha eventually brought the bird close enough for a fantastic view. Other highlights included Black Bulbul, Dull Blue Flycatcher and Sri Lanka White-eye. A hawk (which Uditha believed to be Besra Sparrowhawk) flushed but frustratingly I couldn’t get onto it quickly enough. As the sun rose higher bird activity diminished and by 10.00 we were heading back to the River Garden hotel for a late breakfast. This was our last day in the field and our plan was to head for an area near Ratnapura where we would search for the elusive and endemic Red Slender Loris. Quite a long drive took us Westwards through Balangoda and eventually to the gem-mining town of Ratnapura (which literally means “City of Gems”). We turned off the main road onto a rough minor road which took us to the excellent Ratnaloka Tour Inns. A little pre-lunch birding in the hotel grounds failed to produce the hoped-for Legge’s Flowerpecker but did turn up Black-hooded Oriole, White-breasted Water-hen and Yellow-billed Babbler. However, as we took lunch, the skies were ominously darkening and before long we heard yet again the unwelcome sound of falling rain. In minutes the shower progressed into another tropical downpour and then, finally, into a full-blown storm. Forks of lightning sizzled down and we nearly leapt out of our seats at three or four truly deafening thunder-crashes. The restaurant was an open-sided area with a clear view of a very attractive water garden and we stood gazing out in dismay at the calamitous weather. As the downpour finally eased to a steady drizzle we watched as Red-rumped swallows, House Swifts, Indian Swiftlets and one or two Brown-backed Needletails feasted themselves on the glut of insects that had apparently emerged. Eventually the rain stopped altogether and the clouds began to break up. As this was our last chance we decided to brave the unpromising conditions and have a go for the Red Slender Loris. We arrived at the site, another tea estate, at dusk. The skies were grey in all directions though it wasn’t actually raining and we hoped that we might at least get a couple of hours of time in the field. Climbing down through rows of tea plants we reached a wooded area which evidently was good for Loris and, indeed, for Travancore Flying Squirrel. Uditha worked his way slowly along the tree-line scanning carefully as he went and with Phil and I waiting expectantly on a parallel path some fifteen metres away. This produced only a Fruit Bat (species unknown). We soon reached a point where we were obliged to climb over a barbed wire fence and into the woods, thus taking all of us right into the Loris habitat. The going was difficult with a slippery, stony path to negotiate in the darkness but nevertheless we pressed on. At one point we found a roosting Indian Pitta, a nice sight at three metres! And further along we were treated to a Green Pit Viper – which Uditha cautiously extracted from its perch on a stick for us to inspect. As the snake is quite venomous, even Phil resisted the temptation to pick it up! Otherwise we found little and with time running out we had to call a halt and go back to the hotel for a clean-up. Back at the vehicle we unpicked our impressive collection of leeches (which seem to love waterproof gear) scanning each other in the spot-lights for “ones that got way”. The leeches, (which abound in the highland areas of Sri Lanka and seem especially common in tea estates), effect painless though messy bites, injecting the victim with an anti-coagulant so that they can feed on blood. Of course it is quite unpleasant to have to unpick them but the real problem is that the wounds refuse to clot and leak blood for hours afterwards, staining clothes and anything else with which the victim comes into contact. It only remained then to take our last dinner together and to make the three hour transfer to the airport in Colombo, before saying our farewells to Uditha and Chandana.